VWO’s Form Analysis helps you evaluate your website forms to identify usability problems such as confusing fields, no auto-fill feature, complicated interface, and so on. Evaluation is performed by tracking how users interact with the forms. To read more on Form Analysis, click here. To get started with tracking a form, on the navigation bar, click Form under Analyze. 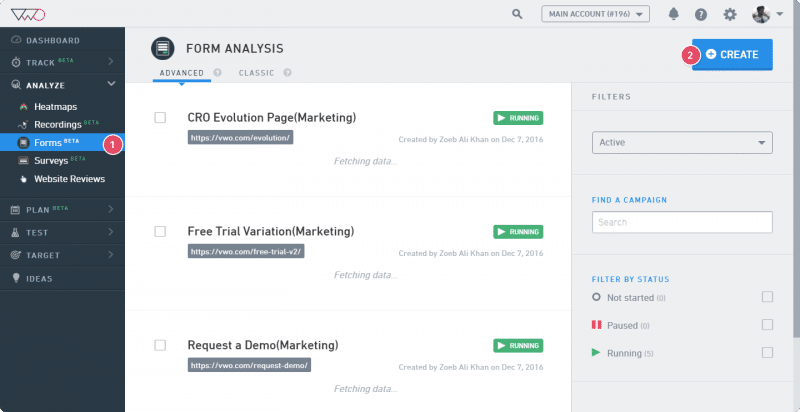 In the upper-right corner of the Form Analysis screen, click Create. To set up a form analysis, you can start by entering a name for the test. Auto detect using a page URL: Select this option to fetch all the forms residing on the specified URL. From the list of fetched forms, select the form you want to track. Manual setup using Form name or ID: Select this option to manually enter the details of the form you want to track. Enter the URL of the page where the form you want to track resides. 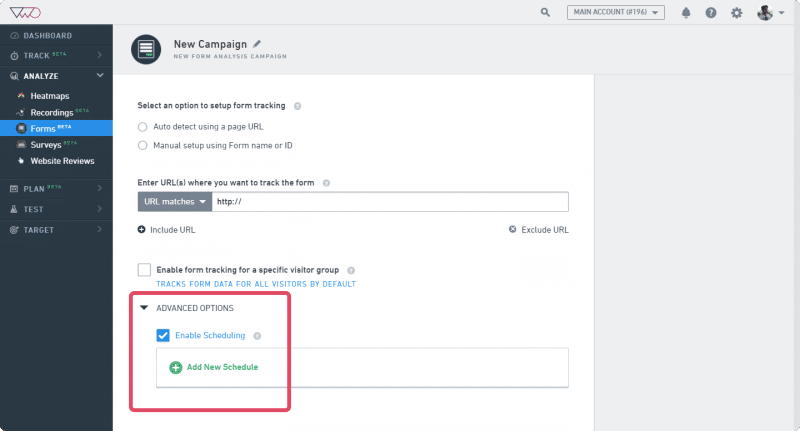 Click Include URL or Exclude URL to include or exclude URLs for the form you want to track. 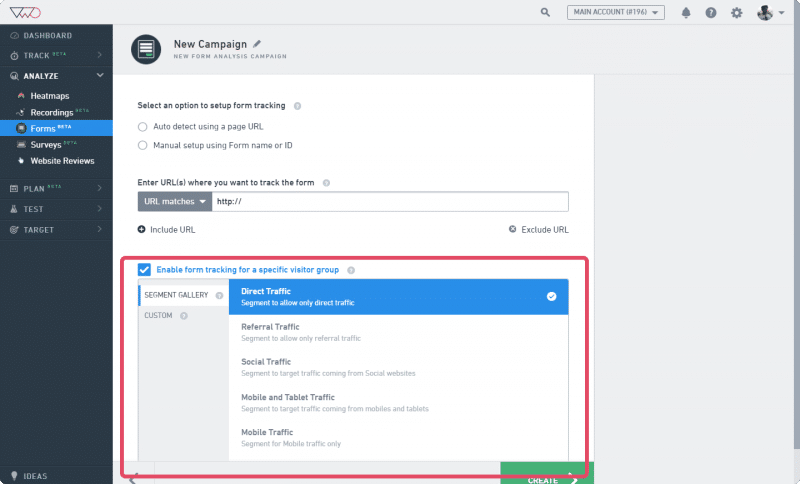 Using this option, you can also define advanced pattern-matching options to include either a broad URL with wildcard entries or a specific URL. To learn more about URL options, click here. PRO-TIP By default, VWO tracks all forms with an ID or a name attribute. If your form does not use either attribute, you can still track it by using the VWO API. You can add “nls_fa_name” to the form tag in the html. Similarly, to track field elements, they must have an ID, name, or the nls_fa_el_name attribute. How to Find Form Name or Id? On the page where the form resides, right-click on the form and select Inspect Element. The browser’s developer tool will appear with the form properties. Check for form properties to find the name or id attribute and use the value for the form analysis set-up. 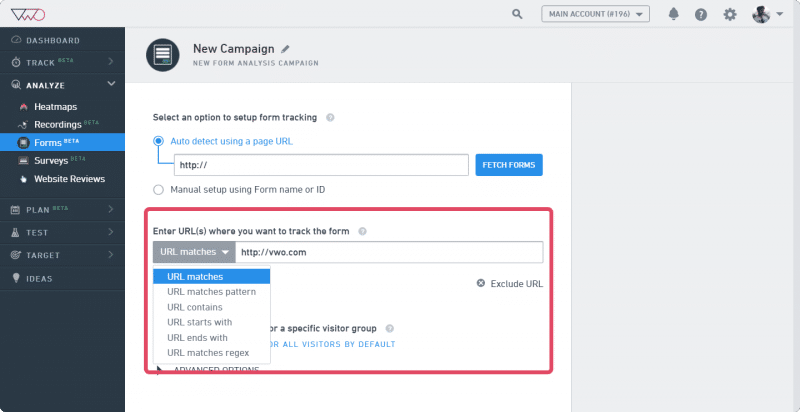 Using VWO, you can record user interaction from within specific visitor segments. Select the Enable campaign for a specific visitor group option. Define segments per metrics such as the geographical location, user device, and other user behaviors. To learn more, click here. Under Advanced Options, select Enable Scheduling. With this option enabled, you can schedule your test to run, pause, or stop at specific times. Click Create to start tracking forms on the website.